With minorities soon becoming the majority, diversity is a big topic. If you want to explore it around Seattle, there are tools to gauge diversity, including percentages of different races and a diversity index. What is a diversity index? It shows the probability that if two people are picked from the same area, they will be of different races. The higher the number, the more diverse the area is. Here are some recommendations that qualify as diverse places and that are just a stone’s throw away. Bellevue, located east of Seattle across Lake Washington, is more diverse than the city of Seattle as of 2013, according to The Seattle Times. Bellevue is 57.6 percent white, 28.7 percent Asian, 7.4 percent Hispanic, 2.2 percent black, and 4.2 percent of other races. One particular area of Bellevue, there is a diversity index of 74. “Bellevue’s growing diversity is attractive to many people from Asia and also around the world,” said Bellevue City Manager Brad Miyake. “With our strong job market – particularly in the tech industry, nationally-recognized public schools, access to culture and the arts, and safe communities – Bellevue continues to be a draw to individuals and families. This richness of diversity is just one of the many things that set our community apart. 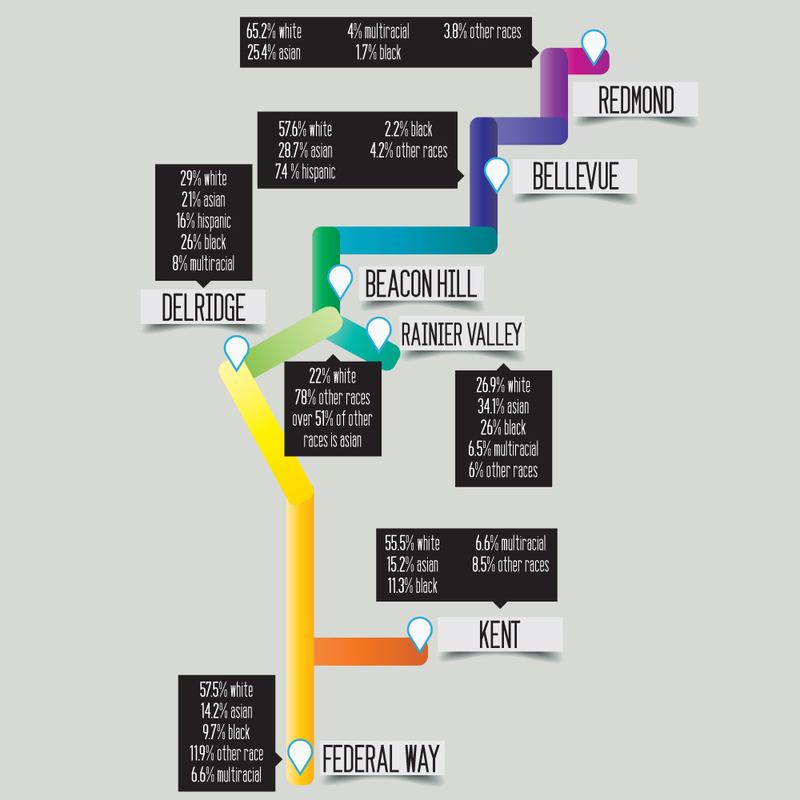 Delridge, located in the West Seattle area, is considered the most diverse area in Seattle with an area close to High Point having 29 percent white, 26 percent black, 21 percent Asian, 16 percent Hispanic, and 8 percent of another race or multiracial, according to The Seattle Times. The diversity index is 77, the same as the number one diverse city in the country, Oakland. Delridge is home to South Seattle Community College, which has an arboretum and botanical garden open to the public and is free. The arboretum houses 40 different varieties of maple trees, 20 different types of ferns, and many other plants and trees. This neighborhood’s diversity goes beyond its people. Kent, located south of Seattle, is 55.5 percent white, 15.2 percent Asian, 11.3 percent black, 8.5 percent other race, and 6.6 percent multiracial, according to U.S. Census data. Its diversity index is 70. In the past 10 years, Kent has seen an increase in the Asian population by 87 percent. Kent Meridian High School is the most racially diverse high school in Washington with 100 countries being represented at the school by the student body. Redmond, located east of Seattle, is 65.2 percent white, 25.4 percent Asian, 4 percent multiracial, 1.7 percent black, and 3.8 percent of another race according to U.S. Census data. Its diversity index is 55.2 percent. In the past 10 years, Redmond has seen an increase in the Asian population by 133 percent. Redmond also has the largest day-time population spike by 111 percent during peak work hours in the United States, probably due to many people commuting to jobs at Microsoft. Rainier Valley is located south of Central District in Seattle, is 26.9 percent white, 34.1 percent Asian, 26 percent black, 6.5 percent multiracial, and 6 percent of other race, according to U.S. Census data. There has been a longstanding rumor that Rainier Valley’s zip code 98118 is the most diverse in the nation. However, the rumor is not true and 98118 comes in at 64th place for diversity according to a previous article in NW Asian Weekly. There are about 17,000 zip codes in the United States, so 64 out of 17,000 isn’t all that bad. There are also more than 50 different languages spoken in this neighborhood.